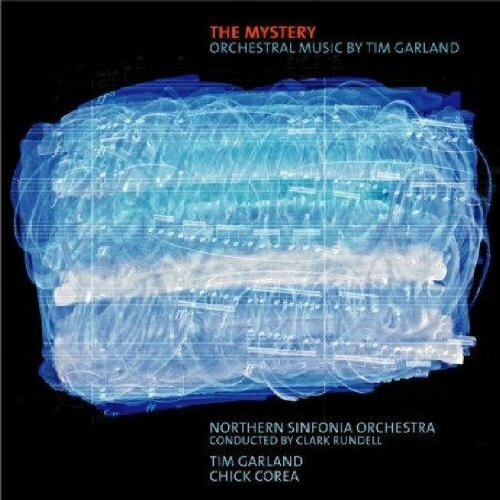 The Mystery is best categorized as a classical recording, featuring the full 36-piece Northern Sinfonia and a program of material largely composed by Garland. But in a time where the twain most certainly can and does meet, Garland also adapts material by Thelonious Monk and guest pianist Chick Corea. Garland’s triptych of Monk’s “Trinkle Trinkle,” “Ruby My Dear” and “Evidence” are in no way, shape or form “jazz with strings.” Instead, Garland uses Monk’s melodies as the foundation for sometimes dramatic, other times understated orchestral works that have little visible reference to the jazz tradition and bear only the slightest resemblance to their source. Still, Monk’s quirky idiosyncrasies are translated into expansive works, demonstrating just how far a creative mind can take seemingly spare material. Garland’s adaptation of Corea’s “Crystal Silence” (“Fantasy on Crystal Silence”) begins with jagged abstraction and sharp dynamics. Corea has dabbled in classical music before, but his interpretation of Garland’s score, which gradually finds its way to the familiar, lyrical theme, is perfect and uncanny. The defining markers are all there, but his integration with the orchestra is absolute. Garland’s soprano takes increasing liberties within the confines of the form, a player who clearly understands that music isn’t “this” or “that” but, instead, a grand spectrum where anything is possible.”Rosa Ballerina,” first heard on Garland’s lesser-known Soho Story (Dean Street, 2001), is transformed into a more nuanced affair, again featuring Garland’s soaring soprano. The title track begins as a Garland/Corea duet, seemingly unencumbered by enforced arrangements; but when the orchestra enters at the half-way point, the arrangement masked beneath the improvisation becomes crystal clear. Listening to The Mystery as a whole suggests that Garland’s encyclopedic knowledge of jazz is equally matched with an appreciation for the longer history of classical music. From romantic interludes to more abstract modernistic passages, The Mystery is a record that breaks down barriers and convincingly asserts that labels, while being of some use to help position an artist and/or the music, ultimately only tell part of the tale. The only way to truly experience a narrative as rich and diverse as The Mystery is to hear it.